There were well over 200 attendees who came along to the Museum of London Docklands for the launch screening of On the Docks – An Oral History of London’s Dock Workers on Friday 18th January 2019. They were treated to an introduction from the young film-makers from Westminster Cathedral Primary School and Riverside Primary School. The children then read out some of their historical and creative writing. The dockers in the audience gave a knowing laugh when some of the slang terms used on the docks were explained! The film was then screened for the very first time to a fabulous reception. 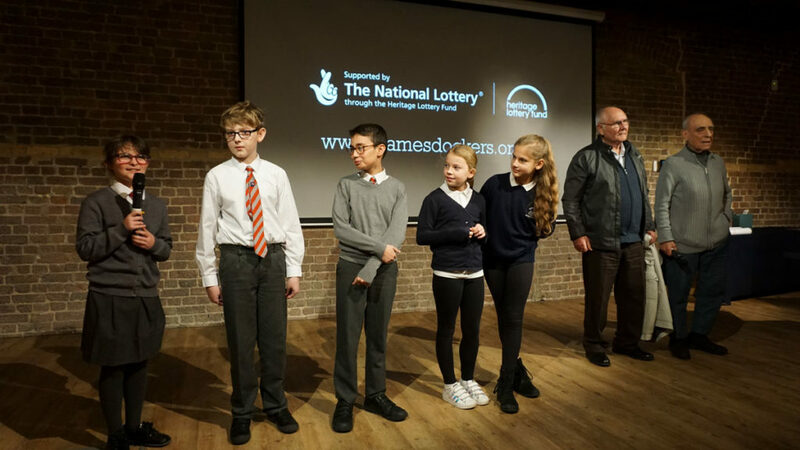 Some of the children, along with Ron Webb and George Warren, who are featured interviewees in the film came on stage to answer question from the audience. The event was then completed by a rousing rendition of Part of the Union – a song by The Strawbs written at the time of the 1972 Dock Strike – by everyone in the theatre. A big thank you to everyone that came along to make the launch screening of the film such a great success.